Tuesday August 8th 1899 I was busy with the work most of the forenoon. I got my dinner over and was ready to see Mrs [McCord], Mrs Hahn, Mrs Lawyer and Carrie Anderson when they called. after they left I went down to Simpsons a little while. Will helped me fix the pickles after I came home. 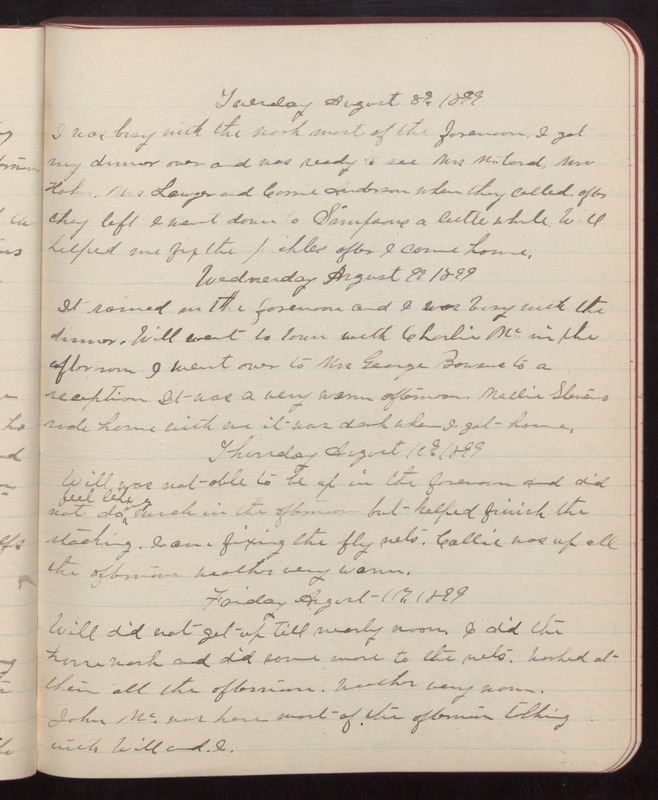 Wednesday August 9th 1899 It rained in the forenoon and I was busy with the dinner. Will went to town with Charlie Mc in the afternoon I went over to Mrs George Bowens to a reception. It was a very warm afternoon. Mallie Stevens rode home with me it was dark when I got home. Thursday August 10th 1899 Will was not able to be up in the forenoon and did not feel like doing much in the afternoon but helped finish the stacking. I am fixing the fly nets. Callie was up all the afternoon. Weather very warm. Friday August 11th 1899 Will did not get up till nearly noon. I did the house work and did some more to the nets. Worked at them all the afternoon. Weather very warm. John Mc was here most of the afternoon talking with Will and I.